This is where the name "Og" for cave men came from! The first stories of Og, a cave boy who lived half a million years ago, appeared on the pages of Boys' Life, the Boy Scout magazine, in December, 1921. 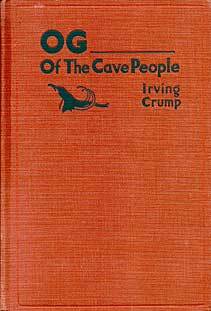 They were written by Irving Crump [1887-1979], a writer and editor of Boys' Life, and in 1922 they were published as a book, "Og - Son of Fire," by Dodd, Mead & Co.
More chapters came out in the magazine in 1924-25, and Dodd, Mead published "Og, Boy of Battle" in 1925. 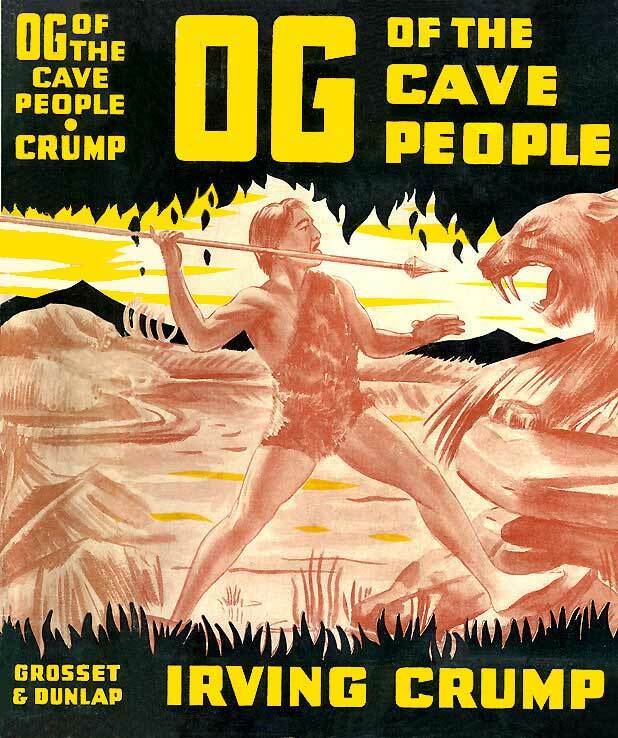 Og appeared in Boys' Life again from 1933-36, and "Og of the Cave People" was published in 1935. A nation-wide radio show, "Og - Son of Fire" aired in 1934-35, hosted by Libby, accompanied by premiums and the publication of a Whitman "Big Little Book" in 1936... which was converted into a Dell comic in 1937. 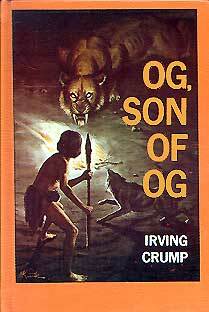 A final sequel, almost 45 years after the first, "Og - Son of Og," appeared in 1965, again preceded by chapters in Boys' Life. Mog, the Mound Builder, the story of a prehistoric American boy, appeared in 1931. 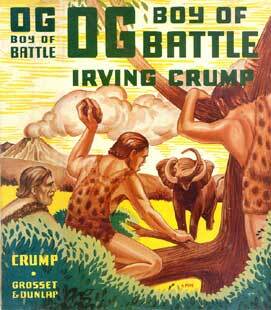 Hank Ward's Irving Crump, Father of Og. 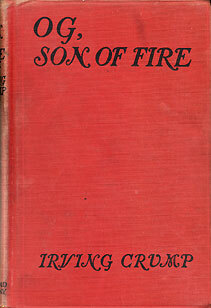 There was also a 1936 reprint, of unknown binding. 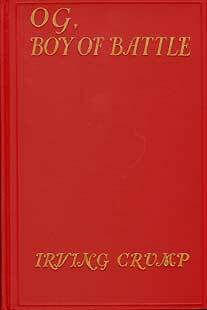 As for the 1946 reprint, besides the cover type change from gilt to black, and the elimination of the Dodd, Mead blindstamp, it is printed on thinner paper, so it is about 2/3 as thick. The illustrations in the 1922 edition were black on pale yellow; in the 1946, black on white. Both editions show "Copyright 1921, 1922 BY IRVING CRUMP" on the tp verso. 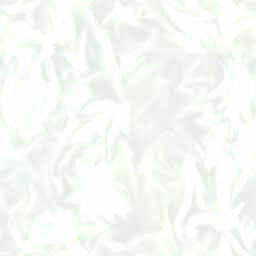 (Do you have a scan of the dust jacket? (Chapters linked below are from the book. Thanks to Martin Abramowitz for help with this "Og - Son of Fire" material! Tampa Campus Library, Special Collections Department! The C.L. 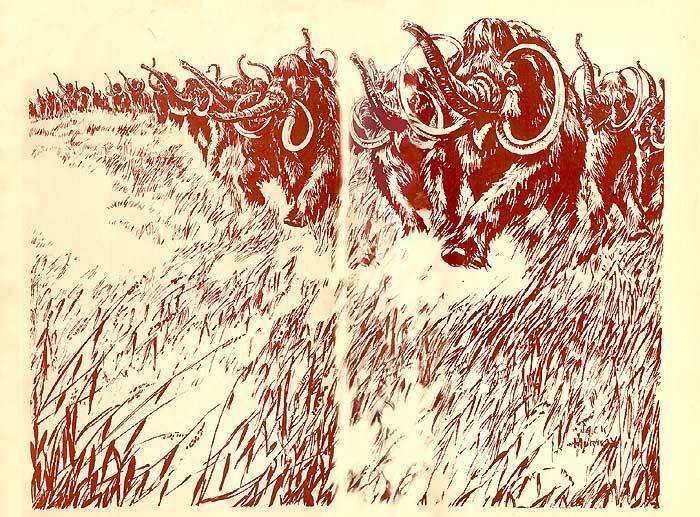 Bull painting of the "great shaggy haired mammoth"
issue of Boys Life, in Chapter 1 of "Og Son of Fire". 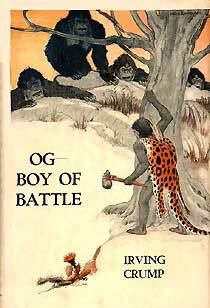 The dustjacket illustrates the title scene of the final chapter, "Treed by a Mastodon,"
left hand are imaginative additions of the cover artist, A. Pope. 21 cm. 289 pp. illustrated by Charles Livingston Bull. frontispiece, 7 plates. New York. 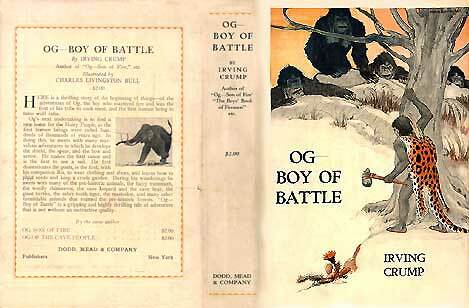 Dodd Mead & Co. ©1924, 1925, 1936. dustjacket paintings by Charles Livingston Bull. reprint: Grosset & Dunlap [n.d.] frontispiece only, no additional plates, dustjacket signed 'A. Pope'. first published in Boys' Life, OCT NOV DEC 1924, JAN FEB MAR JUN AUG SEP OCT 1935. Texts differ slightly. The section summarized at the beginning of "Og and the Fish People" in the September issue is expanded into book chapters 19 and 20. Chapter 24 appears only in the book version. This thrilling story of prehistoric times follows the adventures of Og of the Hairy People  those brute men who lived pretty much like the ferocious animals around them. It was Og who invented a spear and a bow and arrow with which to fight the great cave leopard, the shaggy bear and the sabre-tooth tiger. And it was Og who made the first canoe  and most important of all, the first fire. Gripping and packed with action is this vivid tale of a boy hero who roamed the prehistoric forests hundreds of thousands of years ago. correspond directly to any chapter in the book. (Is there a slightly larger, red/gilt, Dodd, Mead edition? 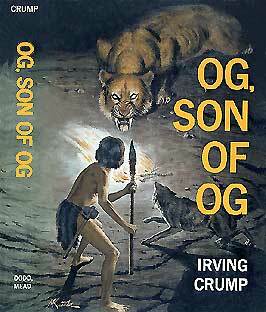 "Og, Son of Fire," "Og, Boy of Battle,"
Og of the Cave People is another book telling of the spirited and thrilling advertures of Og, Son of Fire, who has become so popular through radio dramatizations by the author. Set back a hundred thousand years ago, in the Dawn Age, the men and women of the story are equipped only with crude stone weapons and their new-found friend, fire, and are forced to battle against giant beasts of the jungle and the terrors of nature, as they sturdily lay the founmdations for present-day civilization. Og, with his companions, Ru and Tao, in this book join the backward tribe of Flat Heads, Big Tooth's people. There with their growing intelligence they overcome the superstitions of Pong, the devil doctor, and then start the Flat Heads, who are tree dwellers, on their slow progress upward toward knowledge and understanding. The book is an exciting adventure narrative, filled with action; but it has the background of the probable origin of many things common to-day, such as the canoe, fish-nets, traps, the cultivation of gardens, and the beginning of the domestication of animals. 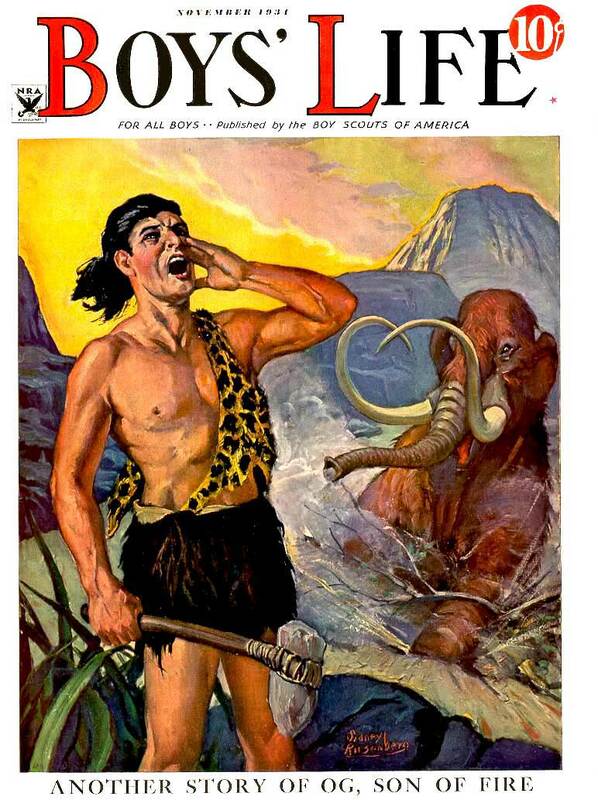 This is a story of the Dawn Age, of Og the Cave Dweller, who lived long ago when men were little better than animals. Og was the first of all human beings to begin the slow march of progress which led toward civilization. He had discovered fire and learned to use crude weapons. Now he continues to lead the struggle against the giant beasts of the jungle and the greater terrors of nature. He joins the backward Flat Heads who still live in trees and helps them learn the simplest elements of knowledge. Ru and Tao are his companions when he overcomes Pong, the devil doctor, when he invents fish nets and traps and when he fights savage beasts and savage men. The thrill-packed adventures of a boy who lived hundreds of thousands of years ago are vividly recreated in this exciting tale of prehistoric times. from the inside flap of the dustjacket: THIS NEW OG BOOK appears in response to popular demand from countless Og fans  three generations of them  who first met this virile cave man nearly fifty years ago in a book. Since then, there have been more Og books, a radio series, cartoon strips, games and figurines of the popular hero. Quite recently, Og, Jr., the son of the original Og, made his debut in Boys' Life. This young cave boy, who is stolen by the ape tribe, is just as prone to breathtakingly dangerous adventures  and the ability to surmount them  as his famous father ever was! 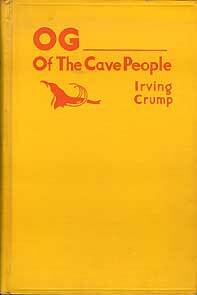 IRVING CRUMP writes of himself: "When I first became editor of Boys' Life, which was so long ago that I don't like to remember that far back, I often received letters from boys asking me how I thought Man had discovered how to make and control fire and use it to cook his food, and how he had developed the bow, the spear, and his other crude stone age weapons. Of course, I did not know. 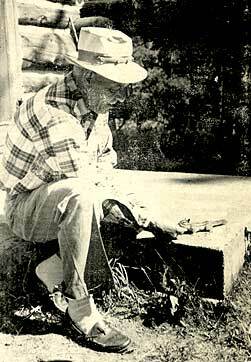 But in those days I had the advantage of talking to men interested in anthropology and archeology and the progress of Man up through the ages, such men as Dr. Roy Chapman Andrews, Dr. Osborne and others. They did not know either  but they had some interesting ideas, all of which inspired me to write the first Og story, Og, Son of Fire. 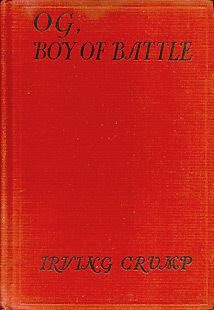 Two other books about this prehistoric boy followed [Og, Boy of Battle (1925), Og of the Cave People (1935)] and a little later Og and his friends were featured on radio for two years. "World War II made interest in Og subside considerably, but it never did disappear entirely and some time after the war a new generation of boys, particularly Boy Scouts, began to write letters to me about him and his adventures. The upshot of all this was the suggestion that Og, Son of Og, might make an interesting prehistoric boy hero, so now it has become his turn to learn how to build a fire, to make his own weapons and to face and overcome the perils of a world rocked by earthquakes and volcanic eruptions and inhabited by the fearsome Saber-Toothed tigers, Hairy Mammoths, Wooly Rhinoceroses, Great Cave Bears, and other menacing creatures. "Primitive camping was carried on by 'Og Patrols' among the Boy Scouts for many years. In fact, when I was a boy, old Dan Beard developed a camping program of that nature which I often practiced as a camper. Dan Beard was one of my heroes in those days, and it was he who furnished the inspiration that made me interested in writing for boys and ultimately becoming the editor of Boys' Life, in which position I served for twenty-five years. "Meanwhile, I wrote numerous books and short stories for boys, and more than one thousand scripts for such radio programs as 'Og, Son of Fire,' 'Jack Armstrong, the All-American Boy,' 'Treasure Island' and others. They have been busy years, but there has, happily, always been time for the pleasures of the out-of-doors, camping, fly fishing and bird watching, and hunting with camera or binoculars, for long ago I gave up carrying a gun with me in the woods. I have no desire whatever to kill any of my furred or feathered friends. There is too much fun watching them as they go about their daily lives in their wilderness homes." 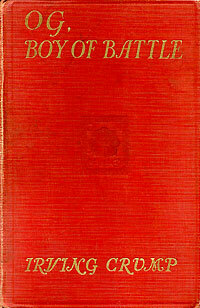 When were the Grosset & Dunlap editions published? 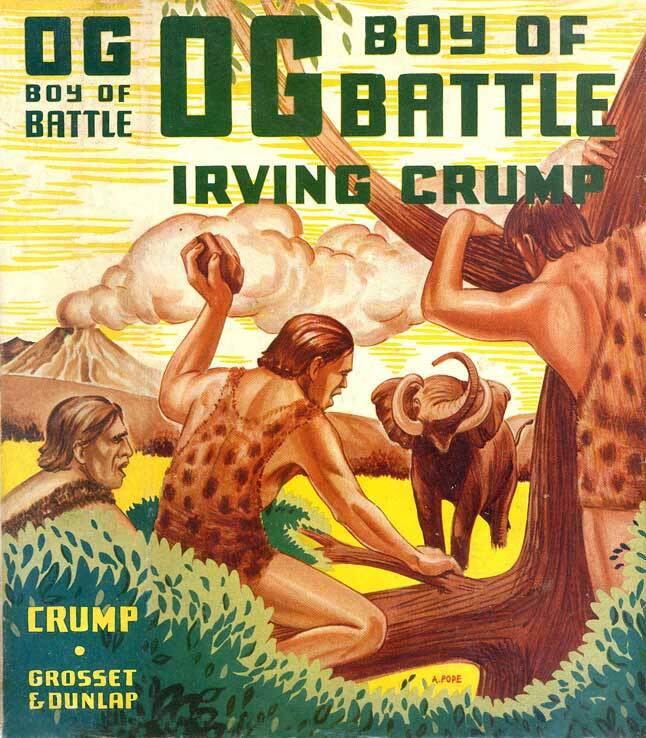 There were three Grosset & Dunlap reprints, Og, Boy of Battle, Og of the Cave People, and Mog, the Mound Builder. I have seen reports of a G&D reprint of Og, Son of Fire, but no confirmation. The dustjackets of the G&D editions do not mention it. 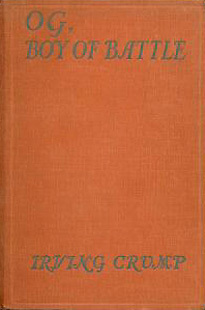 The Grosset & Dunlap reprint of Og, Boy of Battle shows only "Copyright by Irving Crump" on the title page verso, no date; Og of the Cave People shows "Copyright 1935 by Irving Crump"; and Mog, the Mound Builder, "Copyright 1931 by Dodd, Mead and Company, Inc." These dates are the dates of the Dodd, Mead publications. 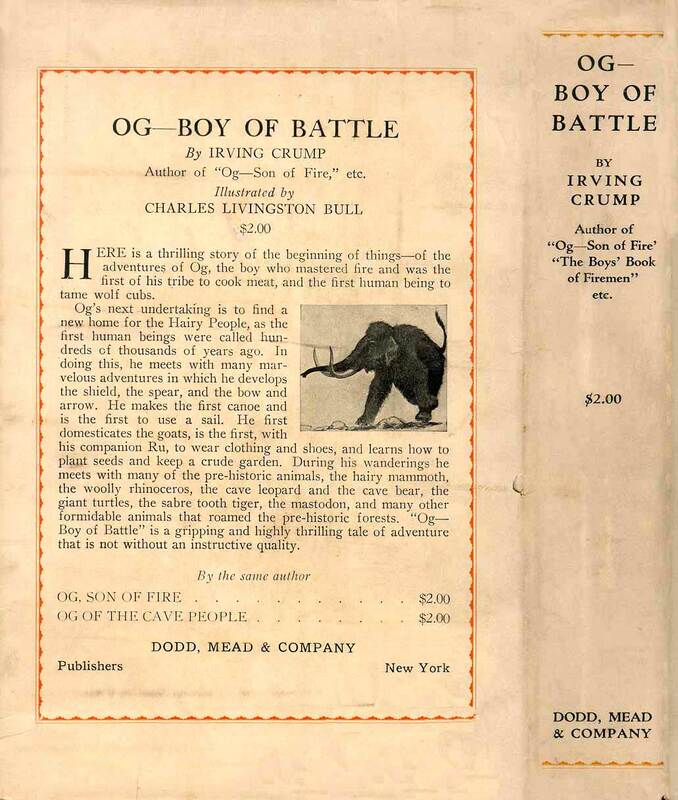 The G&D reprint of Og, Boy of Battle does not include all eight of the Charles Livingston Bull illustrations of the Dodd, Mead edition, only one, as the frontispiece. Similarly with Mog, the Mound Builder. 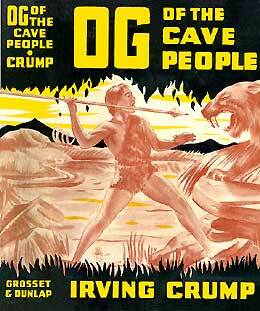 In the case of Og of the Cave People, the illustrations are no longer plates on coated stock, and the reprint edition contains the same set. The three G&D reprints are a uniform edition, apparently published at the same time. The dustjackets, bindings and endpapers make them look like a set. The rear dustjacket flaps advertise all three, with no mention of Og, Son of Fire. They seem to have been priced at $1.00 - no price is explicitly marked, but in the usual price location is "100100" (above). 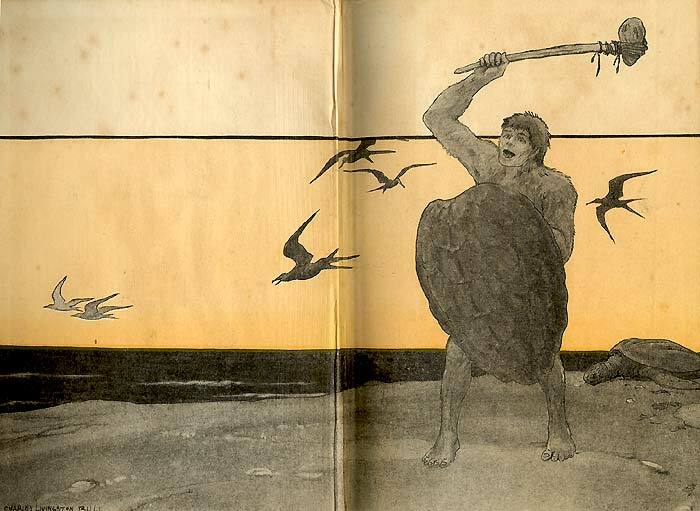 The endpapers use a version of Jack Murray's "Terrors of the Tundra" illustration from the May, 1935 issue of Boys' Life, the same year Dodd, Mead published Og of the Cave People. 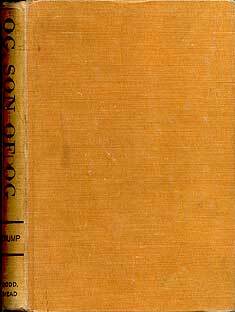 But when were the Grosset & Dunlap reprint editions published? 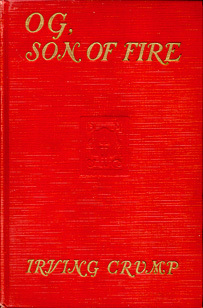 One clue is that there was a 1946 printing of the Dodd, Mead edition of Og, Son of Fire, suggesting that they are later than that. But there was probably no G&D reprint of that book, so it's merely a hint. I'd like to find copies of the dustjackets for the Dodd, Mead editions and any evidence of G&D reprint of the first book... or any other information regarding printings, publication dates, etc. If you can provide further information on these issues, I'd appreciate hearing from you.